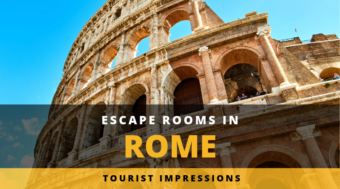 While planning our Escape Rooms for Rome, Busillis Escape was one of our standouts for actually promising to work with roman history in their rooms. 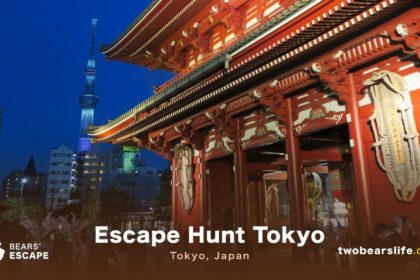 A fact that sounds extra promising for tourists and really exciting – so we contacted the owners and booked a room right away. 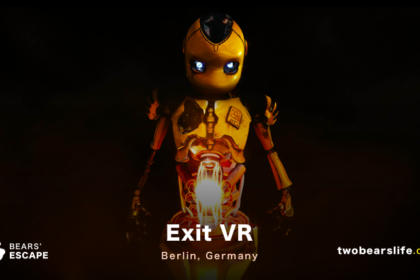 The venue is located fairly central, although you could struggle to find the entry, since it is hidden a little bit in a side street that looks like a closed off space. We arrived a bit early and used our waiting time to explore the nearby area a little bit. After a short snack in a Pizza place, the doors were opened by the owner and his daughter who welcomed us with open arms. We were told that Busillis Escape just opened a couple of month before and they were still very new and very excited to have us play their game. We would be only the second group to play their game. By this point, we started to worry – it was not our intention to beta test their room but to actually play it. Anyway, we continued to have a nice talk about our previous Escape Room experiences in Rome and shortly afterwards the game briefing started. The date is 79 A.D. A bright and sunny morning sun greets you, unknowingly this is the day were one of the greatest natural disasters in human history is about to take place, a volcanic eruption. People have been fleeing from Pompei since a couple of days now, ever since the volcano started spouting ashes and the earthquakes scared most of the familys out of the city. Will you be able to save your family in time and escape the doomed faith of Pompei? Before the start of the game, you and your team will be given some time appropriate garments to wear during the game – which was a good start. They produced a nice video for the introduction into the story and once that was done, we were given blindfolds and were led into the game area. You start in a fairly dark room with just same fake candles illuminating the room. We were told that Pompei is about to go down and we will have an hour to solve the mysteries and puzzles of the room to escape before being caught in the fires of the volcano. Interesting setup for sure – sadly we struggled from that point onwards. The dark room was hard to navigate – the candles help, but it was really hard to even read the paper clues. We were confused about what to do right from the start and sadly, it did not get better. Although you could feel the love that went into the room and the decoration, the approach to stay so close to what was time appropriate in contrast to being good game elements proved problematic. 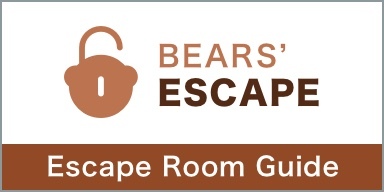 Although we asked and received a lot of help over a big beamer-wall in the main room, we were not able to escape – not even close. 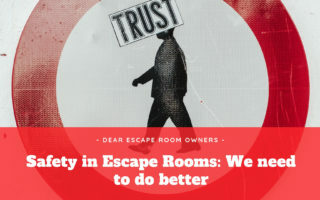 First of all, we have to be very clear – this represents our experience and it may be possible that since our visit in May of 2017, Busillis Escape has made some major improvements to their game. The start was promising and the owner as well as his daughter were super friendly and welcoming. Sadly, the game we played had big problems. It starts with the fact that even on the website, it is not clear if they offer one or multiple rooms. 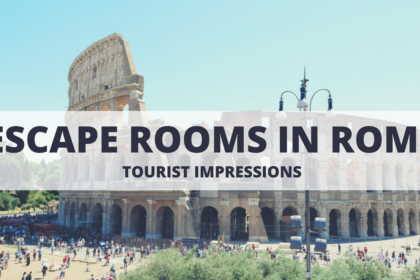 We were under the impression that the one room they offer is “Pompei 79 DC”, but on location, we were told they have multiple rooms. In the booking process, there is a stage where you can choose between different chambers. But there is absolutely no information what that means. We thought it is just the same room copied for bigger groups. But according to the information we were given on location, the other chambers are other games. That should be made clear on the website. By the way – the website is fully in english – until you start the booking process. Which led to our confusion about the number of rooms. Anyway – the bigger problem was actually the room itself. It was way too dark for us to solve the given puzzles. The additional elements you are given are time-appropriate … sure – but please don’t expect us to solve math equations on a wax-scrape-book the size of an iPhone with hardly any light. We get that immersion is good, but not on a level were playing the game gets nearly impossible. That is simply not fun. Outside Knowledge and Staying True to History? Busillis Escape expects quite some outside knowledge or information that will later be given to you with additional clues on their screen. For example: going into the room, we did not know what a Pompei calendar looks like. 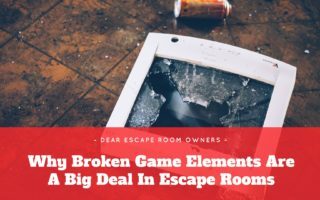 Sure, it is cool to combine an Escape Room with a learning experience, but if a player needs to ask for a clue to even understand what certain game elements are, that’s not good. Information like that should be provided in the room. It clearly pains us to write a review this harsh, because we were welcomed and treated so nicely. On the other hand, a lot of these issues are effecting the game in a big way and players should not be sent to a room that has clearly not been tested enough. The issues described and also discussed on location can be dealt with to fix the game (of course) – so if we get any updates on changes or improvements, we will edit the review accordingly. 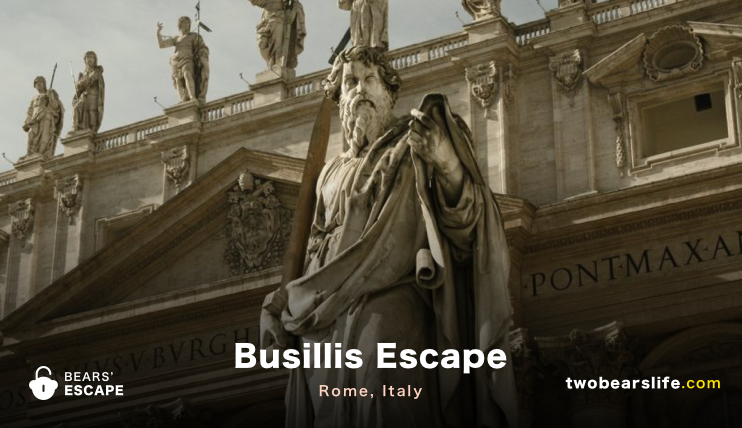 Busillis Escape in Rome is located fairly close to the city centre and easily reachable with public transport. 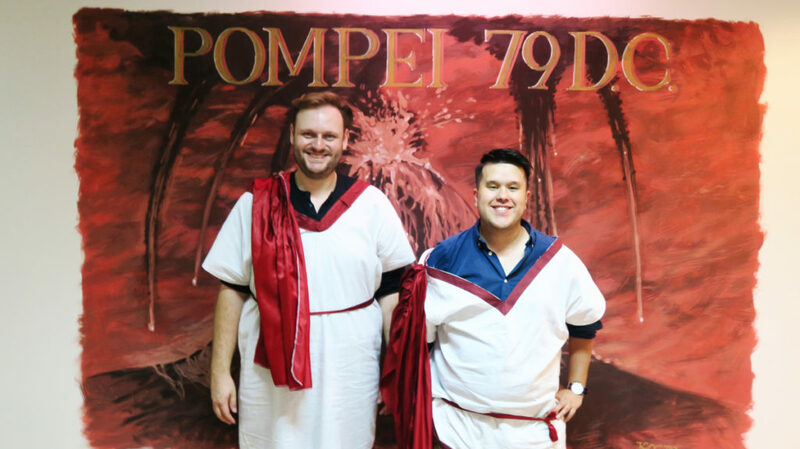 They offer a tourist friendly theme with “Pompei 79 DC”. The owner and host were really friendly and spoke english well enough. Sadly, the game itself was still very new and had a lot of problems – starting with the frustrating level of lighting to asking players for outside knowledge that most tourists simply wouldn’t have. A lot of the problems are fixable, but when we played the game in May 2017, we would not recommend to try it in the state it was in.